Born in Yokohama City in Japan. Erika go out to travel cross an Asian continent and running through the Africa continent in 2001.And, she met mbira Music in Zimbabwe. Begin to draw the picture on the way of travel. Erika returns to Japan in 2003. Erika　began to introduce the Mbira by performing and teaching after returning to Japan. She went to the mbira training in Zimbabwe in 2006,2008,2009. She learnt Mubira musice from Luken・kuwari・pashipamire, and the dance and the song from more teachers. 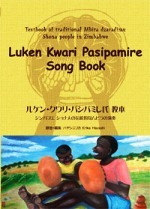 The picture book of the mbira is published in 2006. CD"mondioro”and the mbira textbook are published in 2008. Erika invites Luken・kuwari・pashipamire to Japan in 2009, and produce a Japanese tour. The workshop and the performance of the mbira are actively done. Please inform me of commodity, your name, an address, and the telephone number by e-mail. I inform you of the total amount and the payment method. MrLuken kuwari pashipamire　plays and succeeds the tradition of the mbira by coming from Ｍondoro. 12 mbira songs collected to CD"MONDORO".It wants to do good quality mastering and we will recommend "MONDORO" if it is assumed the ornamental use. Textbook on page 52 to which the kushaura, kutsinhira, lyrics, and mbira Music's outlines are written. Parallel description of all English and Japanese. CD2 piece of 12 kushaura ,kutsinhira, and complete performance.